While we're having 80 degree weather here in Southern California, in other parts of the country it's COLD! Keith in NYC is going sledding. Even when the weather is warm, I love soup. In honor of all that are cold, here's a repost of my Albondigas Soup from Facebook. Growing up in Southern California exposes one to a lot of delicious Mexican food. Not only are there a lot of really good restaurants, but one learns the best cooking tips from friends and their families. Albondigas soup is a family favorite. I remember cooking it when we'd take the kids around the Eastern Sierra--when they were little--and we had a truck & camper. It's so easy to make, even in that tiny kitchen. The four of us would snuggle up on a cold night in that camper, with snow outside, warming ourselves with this soup. Recently, Karen made it for the ladies at her church, with great results. I decided to make a pot and deliver some to family & friends. This recipe makes a lot. It will fill a 12 quart pot, so you'll have lots to share! My mom always used Mrs. Cubbison's seasoned dressing, that's why the smell and taste of these breadcrumbs signals comfort food to me. I start the meatball mixture with 1 cup crushed dressing crumbs, but Gary likes the meatballs less meaty, so I might use 2 cups of crumbs. I crush the breadcrumbs with a tenderizer mallet, makes less of a mess if you crush them in the bag. I have some flat leafed parsley growing in my front yard. Whenever I need some, I go out and pick a small bunch. It's so convenient to always have it on hand. There's curly leafed parsley growing here too. Be on the lookout for any pesky snails. 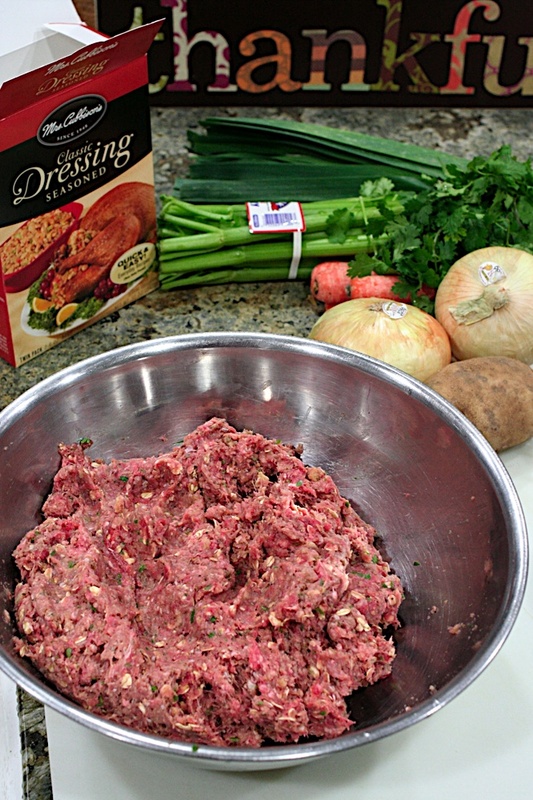 Chop the parsley and add it to the rest of the ingredients to make the albondigas. Or, adondibodie, as a favorite salad-dodger nephew might say. "WHO put too many vegetables in the a-don-di-bodeeeee???!!!" Using a small ice cream/cookie scoop, or a tablespoon, make the meatballs. Keep a small bowl of water handy to wet your hands and the scooper so the mixture doesn't stick. Now to make the soup. I like these Mayan sweet onions at Costco. 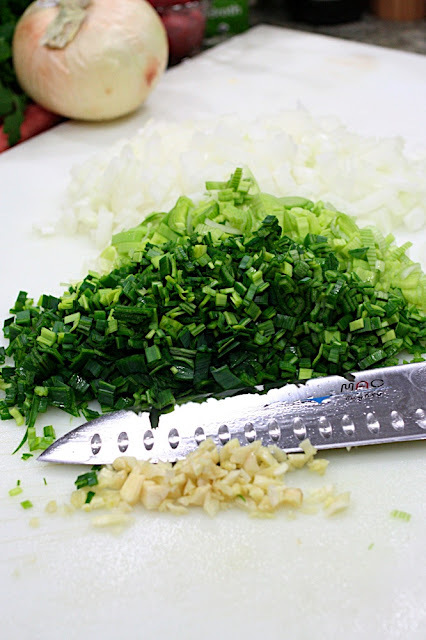 Begin by cutting the onion in half, cutting off the ends and taking off the outer skin layer. Then remove the root core. Cut the onion in both directions, vertically & horizontally, keeping it together. Leeks have a lot of dirt between the leaves, so you have to cut them and wash them thoroughly. There's dirt in-between the layers of the green part too. The worst thing is crunching into sand, so be sure to wash them well! Slice the stalk and dice into small pieces. 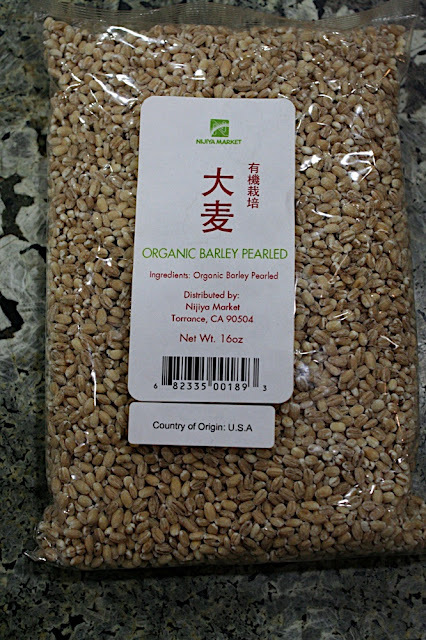 If you grew up at the East San Gabriel Valley Japanese Community Center like I did, you might be remembering Beans Sogioka about now, and his joke, "Take A Leek from Sogioka Farms!" Slice up the tops, too. You don't want to be wasteful, or hear my voice saying, 'mottainai'. Give the garlic a rough chop. Saute the onions in a little bit of olive oil and get them sizzling and sweating. 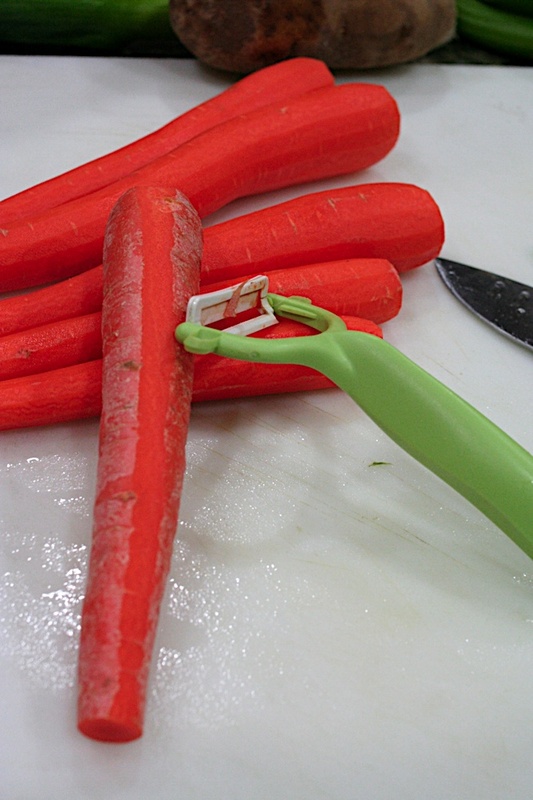 Peel & chop the carrots. Add them, along with the mushrooms, into the pot. Add two cans of stewed tomatoes. Chop them up a bit the your spoon. Add a little red wine. About a half-cup or so. There was a little bit left in this bottle my dad brought over for Thanksgiving. 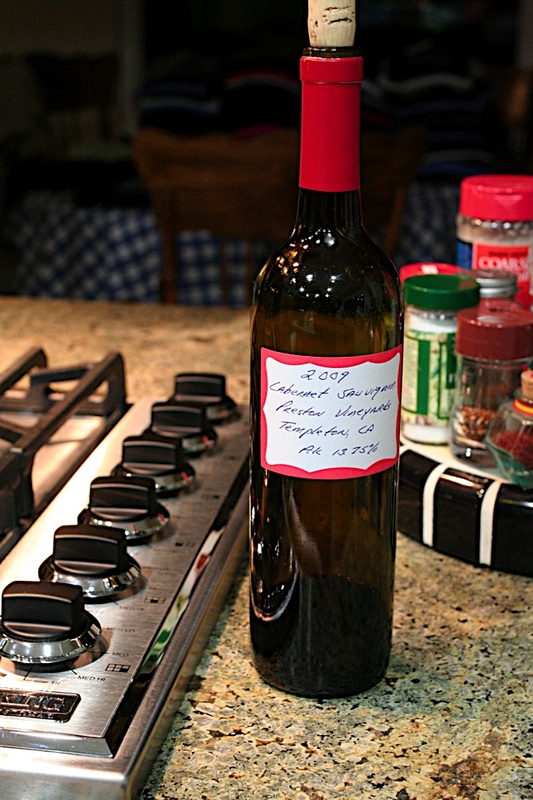 Homemade wine. I didn't have any of it, but those who did said it was good! I like to add about a half cup of pearl barley. I like the chewiness of it. After the veggies have softened a bit, add water and some tomato paste. A small can is plenty for this large pot. Add water to cover the vegetables, so they're floating in broth, not just sitting. When the soup boils, it's time to add the meatballs. Don't worry about the foam just yet. You're going to skim that off later. As the meatballs cook, the fat in the meat is released. Skim the fat off. Skim the foam off too. The meatballs are done when they float to the top. Lower the heat and simmer gently 15 to 20 minutes to let the flavors meld. After the flavors have a chance to come together, taste the broth. Adjust the seasoning with salt & pepper. Add some chopped cilantro to each bowl or to the whole pot. The secret to making good albondigas soup is to make it with ingredients you like. Add more/less tomato, squashes, corn, spices--thyme, rosemary, etc., whatever you have on hand. Thanks to all my Facebook friends that wrote to tell me they tried the soup and how it was a hit with their families. Love you guys! I like to add lots of oregano and a laurel leaf to the broth and cumin, carrots, and some mexican rice to the meatballs. 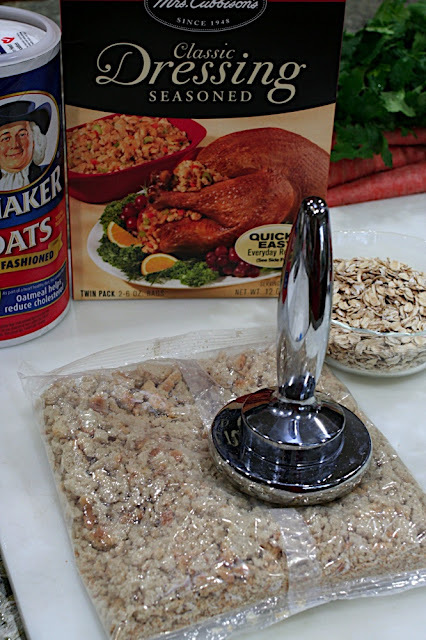 I don't think I've had them with oats before but that's an interesting idea to help them hold the moisture in addition to breadcrumbs (for me it's plain toasted weber's bread like my grandma uses). and I laughed when I heard you saying "motainai" in my head. That looks like a lot of chopping and a lot of work, and soup's not food! But I think I'm going to try it very soon, it looks amazing!